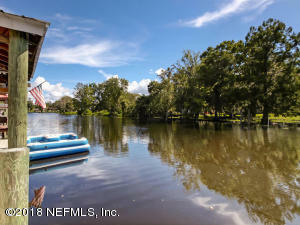 WATERFRONT with Dock and Navigable to the St Johns River in tranquil Snug Harbour Community. This Townhome is Move In Ready. Gleaming Wood floors throughout the first floor. MBR has enormous private bath, walk in closet & Private Waterfront Balcony! The other 2 bedrooms share a Jack & Jill Bath. The pristine kitchen has granite counters with slate tile backsplash. Place your table and chairs in the spacious kitchen. Open floor plan with beautiful view of the Water. Living Room has built entertainment cabinet & in ceiling speakers. Lots of extras in this home, crown molding, ClearView Retractable Screens, closet pantry, storage under stairs, can lighting. Enjoy the tranquil outdoors on the back deck! Great for entertaining! 2 Car garage w/storage above! Great location...peaceful & quite!